With some themes, UberMenu may replace only the theme’s responsive or mobile menu, but the main menu remains unchanged. This happens when the theme calls wp_nav_menu twice with the same theme_location. As a result, UberMenu is only applied to the first instance of the theme location, and if the mobile menu is printed first by the theme, only the mobile menu will be affected. Any changes you make to your theme should be done in a child theme. Generally this just means copying over the header.php and modifying it accordingly. Many themes already include a starter child theme for you. Note that if you just want to use UberMenu as both your main and mobile menu, simply remove the wp_nav_menu call for the mobile menu. 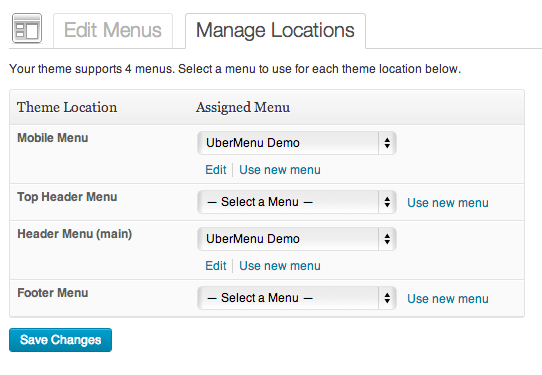 UberMenu only needs one instance to be responsive. If you want to maintain your theme’s mobile/responsive menu but use UberMenu as your main menu, the solution is to separate these two menus with two different theme locations. If you are using multiple UberMenus, this instance value will apply to all of them; so if some of your theme locations need instance 1 and others need instance 2, you’ll need to sort that out via templates (as shown below) rather than this setting. If your theme has residual styling (see also: residual styling troubleshooting guide), you’ll still need to edit the template file to remove the residual styling from around the desktop menu. 2. Copy your header.php (or whichever template file contains your mobile menu) into your child theme. 3. Go back to your Manage Locations Panel, under Appearance > Menus > Manage Locations (tab), and assign your main menu to the Mobile Menu theme location. Adjust the breakpoint as necessary for your theme.